The Freedom From Religion Foundation will be represented by renowned legal scholar Erwin Chemerinsky in opposing a request today by Morris County, N.J., asking the Supreme Court to overturn FFRF’s resounding victory this spring against taxpayer subsidy of churches. 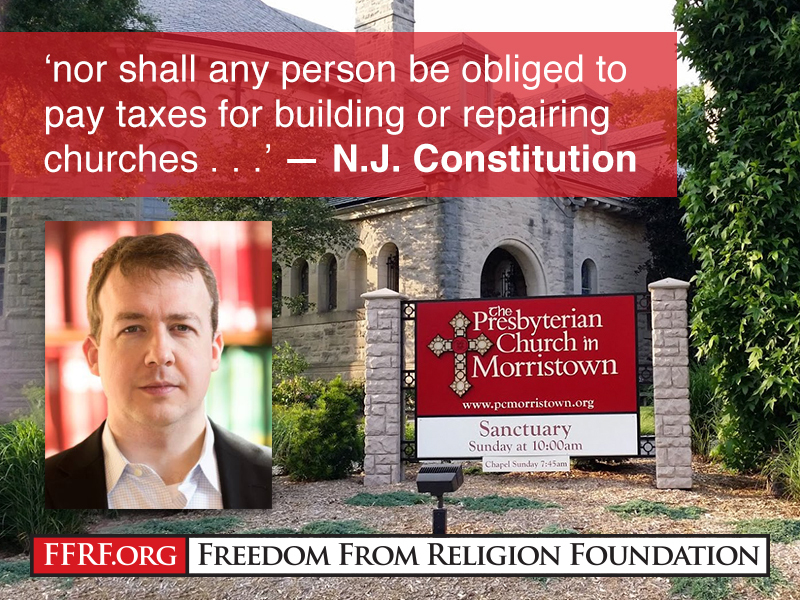 Morris County, defended by the Catholic Becket Fund, is asking the U.S. Supreme Court to take its appeal of FFRF’s firm victory, and overrule the state supreme court’s decision against funding religious worship. The New Jersey Supreme Court unanimously held in April that state taxpayers cannot be forced to pay to repair active houses of worship, several of which explicitly sought taxpayer funds in order to further their worship services. This decision will save New Jersey taxpayers many millions of dollars and protects the religious liberty of all New Jersey residents. At the heart of the lawsuit, argued in New Jersey state court, is the New Jersey Constitution’s guarantee: “nor shall any person be obliged to pay tithes, taxes, or other rates for building or repairing any church or churches, place or places of worship, or for the maintenance of any minister or ministry, contrary to what he believes to be right.” Art. I, Para. 3. This taxpayer protection predates the creation of the United States and is a principle Founders, including Thomas Jefferson, saw as an essential guarantee to prevent the government from forcing citizens to support religions in which they disbelieve. FFRF, with the help of University of California at Berkeley School of Law Dean Erwin Chemerinsky, will soon file a response to the county’s petition, urging the high court court to deny cert. (reject the requested review). “We’re confident that the U.S. Supreme Court will either deny review or will accept the case only to clarify that the New Jersey Supreme Court got the case exactly right,” comments FFRF Co-President Dan Barker. Plaintiffs in the case are David Steketee, an FFRF member, and FFRF itself. In New Jersey state court, Steketee and FFRF were represented by outside counsel Paul Grosswald and FFRF attorneys Andrew Seidel and Ryan Jayne, who will continue as co-counsel. Chemerinsky is one of the most cited legal scholars of all time and has argued several cases before the Supreme Court. FFRF is a state/church watchdog comprised of mostly nonreligious 32,000 members nationwide, including 600-plus in New Jersey. It is celebrating its 40th year as a national group.